There is unfortunately a large emphasis in current vitamin D research that overstates the benefits of vitamin D supplementation on the conclusions of studies conducted on UV exposure from the sun. Such disparities in reporting have obviously increased the supplement market for this valuable nutrient, however vitamin D from sunlight exposure and supplementation may not be interchangeable in terms of effectiveness. Vitamin D would be essential if it did nothing else. But researchers have discovered that it’s active in many tissues and cells besides bone and controls an enormous number of genes, including some associated with cancers, autoimmune disease, and infection. Hardly a month goes by without news about the risks of vitamin D deficiency or about a potential role for the vitamin in warding off diseases, including breast cancer, multiple sclerosis, and even schizophrenia. In June 2008, a study published in the Archives of Internal Medicine found that low blood levels of vitamin D were associated with a doubled risk of death overall and from cardiovascular causes in women and men (average age 62) referred to a cardiac center for coronary angiography. At a scientific meeting in May 2008, Canadian researchers reported that vitamin D deficiency was linked to poorer outcomes in women with breast cancer. And a large study of aging in the Netherlands published in the May 2008 issue of Archives of General Psychiatry found a relationship between vitamin D deficiency and depression in women and men ages 65 to 95. Current national guidelines suggest that people should maintain a minimum blood serum level of 20 ng/ml, although there is much scientific debate about optimum level. Many experts are now suggesting that the guidelines be doubled and even tripled to 60 ng/ml to prevent disease. Vitamin D has long been known to contribute to bone health by promoting the absorption of calcium. In recent years, much attention has been paid to its possible immune and inflammatory benefits. It's been known that vitamin D can prevent that genetic damage. When vitamin D binds to specific receptors, it sets off a chain of events by which many toxic agents including cancer cells are rendered harmless. However, if there is not enough vitamin D the system can become overwhelmed and cancer can develop. "This is one of the reasons that people living closest to the equator have a much lower incidence (or absence) of specific cancers which consequently increase in locations further from the equator," said McGill professors Dr. John White. “For years, my lab has been dedicated to studying the molecular mechanisms of vitamin D in human cancer cells, particularly its role in stopping their proliferation,” said Prof. White. Researchers have also discovered specific molecular signaling events by which vitamin D prevents inflammation. In their experiments, they showed that low levels of Vitamin D, comparable to levels found in millions of people, failed to inhibit the inflammatory cascade--a series of rapid biochemical events which propagates and matures the inflammatory response. However, levels considered adequate did inhibit inflammatory signaling. They reported their results in the March 1, 2011, issue of The Journal of Immunology. Under the right circumstances, 10 to 15 minutes of sun on the arms and legs a few times a week can generate nearly all the vitamin D we need. Unfortunately, the “right circumstances” are elusive: the season, the time of day, where you live, cloud cover, and even pollution affect the amount of UVB that reaches your skin. What’s more, your skin’s production of vitamin D is influenced by age (people ages 65 and over generate only one-fourth as much as people in their 20s do), skin color (African Americans have, on average, about half as much vitamin D in their blood as white Americans), and sunscreen use (though experts don’t all agree on the extent to which sunscreen interferes with sun-related vitamin D production). Pale populations have multiplied and have migrated across the earth, many times to geographic regions which are to their disadvantage. Researchers have noted that sunlight and supplements are not the only factors that can determine the level of vitamin D in a person's body. Lighter skin color allows deeper penetration by UV-B rays, which decreases the amount of sunlight exposure needed for adequate vitamin D production. If you have darker skin, it's harder for UV-B rays to penetrate your skin and create vitamin D, which means that you need greater exposure to sunlight than someone with lighter skin. Some inherited differences in the way people's bodies process vitamin D into the active form also have a strong effect on people's vitamin D levels. Dr. Anthony Petaku who studies the effects of Vitamin D2 and D3 on mutating cells, says the incidence of disease increases the further away we are from the equator. "The millions of people who live near the equator are not susceptible to the same level of disease or even the same diseases as those who live further from the equator," he stated. Dr. Petaku has found that latitude studies which are observational on vitamin D and disease show a clear correlation between solar UV radiation, latitude and vitamin D status. "Almost every disease decreases in frequency and duration as we move away from equatorial populations, and the data shows that there is a minimum of a 1000 percent increase for many diseases in countries furthest from the equator, however we have obtained the same results based on data through populations and vitamin D supplementation," he concluded. Researchers from the University of California, San Diego School of Medicine has found that low serum vitamin D levels in the months preceding diagnosis may predict a high risk of premenopausal breast cancer. The study of blood levels of 1,200 healthy women found that women whose serum vitamin D level was low during the three-month period just before diagnosis had approximately three times the risk of breast cancer as women in the highest vitamin D group. The study is currently published online in the journal Cancer Causes and Control . Exposure to sunlight and vitamin D has been shown to effectively deal with toxins including medications. A study rom the Swedish medical university Karolinska Institutet has shown that the body's ability to break down medicines may be closely related to exposure to sunlight, and thus may vary with the seasons. Making vitamin D through sun exposure is the natural way to maintain D levels as shown through hundreds of thousands of years of human history. To make vitamin D, you need UV-B rays to come into direct contact with your skin. 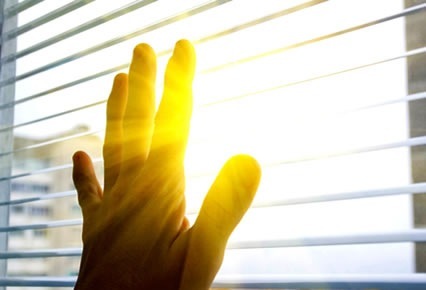 UV-B rays cannot penetrate glass, so you don't make any vitamin D while you're sitting in a car or by a window at work or at home. If you live above 35 degrees latitude north or below 35 degrees latitude south, you receive little to no UV-B rays from some point in autumn to some point in spring. During this time, your body has to rely on the vitamin D that it has created during warmer months, or on intake of vitamin D through food and supplements. The further north or south you live from the equator, the less exposure you have to UV-B rays. The higher you live above sea level, the greater exposure you have to UV-B rays. Both decrease the number of UV-B rays that reach you. With each passing year, natural degenerative changes that occur in your skin make it harder for UV-B rays to convert cholesterol in your skin into vitamin D. It's a known fact that elderly people need to rely more on food sources than sunlight for their vitamin D. At 70 years of age, the average person has approximately 30% of the capacity to generate vitamin D from sunlight that a 20-year old has. Van der Rhee H, Coebergh JW, de Vries E. Sunlight, vitamin D and the prevention of cancer: a systematic review of epidemiological studies. Eur J Cancer Prev. 2009 Nov;18(6):458-75 concluded that while vitamin D levels/supplementation was only consistently associated with a decrease in colon cancer, sun exposure was consistently associated with a decrease in all four cancer types including four cancer types: breast, colon, prostate and lymphoma. Vitamin D supplementation will clearly never match natural sunlight and it's time researchers and scientists started taking a more serious approach to large populations studies on UV exposure and vitamin D status so the world can better ascertain the true effect of the sun versus supplementation. This page contains a single entry by sal published on January 25, 2013 10:32 AM. EPA giving pass to chemicals seen as threat to bees by EU scientists was the previous entry in this blog. Grape Seed Extract May Beat Chemo in Late-Stage Cancer is the next entry in this blog.